Our client, a 39 year old female, was a driver of an Astro minivan which was rear ended by an Infinity. The defense expert estimated the speed at impact to be 8 to 9 miles per hour. At the time of impact, the plaintiff had one hand (the injured hand) on the steering wheel. Unfortunately, the plaintiff developed RSD and we contended that the low impact accident caused the Reflex Sympathetic Dystostrophy. The defendants maintained that the low impact accident could not have caused the wrist injury and that the plaintiff had no complaints to the wrist until six days post accident. The defendants maintained that the RSD was caused by something other than the accident. Our client sustained various soft tissue injuries and a sprain to her right wrist. Immediately after the accident she went to the emergency room but no complaints were made of any wrist pain. Two days later she purchased a bandage for her wrist and the first documented complaints of wrist pain occurred 6 days after the incident. The condition unfortunately worsened and developed into Reflex Sympathetic Dystostrophy. The dispute in the case arose because the defendants argued that the condition was caused by something other than an automobile accident which was considered minor in nature. After we presented our case and fought the defendants throughout the litigation, our RSD attorneys settled her case for $285,000.00 on the first day of trial. 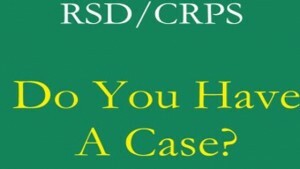 This is representative of what we can do for an RSD client, even in the toughest of cases.